PDF to Word Converter is an easy to use utility that does swift conversions from PDF to Word. You just need to add the file which you intend to convert into the program and click Convert. It is that easy! This program will create an exact copy of the PDF file. It will retain all graphics, fonts and formatting. It supports all versions of MS Word so that you would not have any troubles editing the converted file. Free PDF to Word Converter offers several ways to convert your documents; you can either right click the document and select "convert PDF to editable format" or use the program´s interface which is very intuitive and allows one-click-conversions. - Absolutely free, no charges or obligations. - Will retain the original layout of the document. 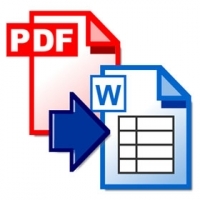 - Fast conversion from PDF to Word. - Support for MS Word 2003 and 2007. - Supports all Windows systems.